I finally completed my first 21k run in the Ayala Eco Dash event (held in Sept 13). It was the farthest that I have ran so far since I officially run in March. I have been slowed down by series of injuries and sickness which held me to keep up with my training plan. I was actually looking at the NB Power Race as my first 21k, but since I have a long run scheduled on this date so I decided to do it then. A week of raining has been a major factor in slowing most of the runners to complete their weekly runs I myself was limited to 6k a week before the Ayala Eco Dash event. Was thinking of doing a 10k instead but I was already registered. I had a scheduled early morning runs during the week and every time I wake up at 3am, the rain was pouring hard and obviously I have skipped all those running days. Saturday night, it was still raining and said to myself, if it still rains when I wake up, I will not go to the event and instead run in near my area if the rain would stop. At 3am, went outside the house and seems like it’s going to rain, texted Jay and said that we’ll just check at the Fort if its raining. I figured, we will all run rain or shine. On the way to the fort, it was raining hard at SLEX but as per Jay who was at the venue earlier said that there was no rain. Honestly, I was a bit hesitant because I will be running 21k and felt that I was not that prepared since I missed some mileage during the week. I was a bit late and the scheduled gun start was at 5am, however, it was moved to 5:30am, seems like I was really destined to finish my 21k. 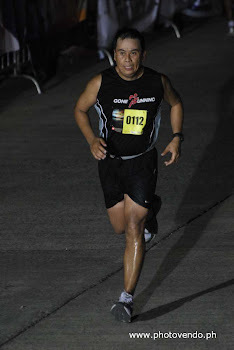 As soon as I arrived at the Fort and saw runners getting ready, my determination came back and was psyched to do my 21k. But since it was an LSD run for me, I will have to “jog” slow at 7:30min/km. Since I had my hesitation in the beginning, I found myself not prepared for the race. I was late, I was not able to do proper stretching, my race bib was not yet attached. There were 2 race bibs, one for the front and the other at the back, and since I was rushing, I did not put the bib at the back. I can feel the stress since it was not a good way to start a run. But this has become a lesson learned for me. Hopefully in the next races I will be more prepared. At the starting line, I was with Jay, Val, and Kuya Erning and moments later Junrox (tigerboy) came in and joined us. Told Junrox that this was my first 21k and will be running slow, he gave some motivational words as he is an experienced runner already. I saw Bald Runner at the starting line and introduced myself and the rest of the guys. Nice meeting you Mr. Jovie. Jay and Val said that they will pace with me and will run along until the finish line, had a sigh of relief as for sure I will struggle if I will be running alone. So off we all went as soon as the gun start was fired. We had an easy cruise and was enjoying the comfortable pace. As we were going up the kalayaan bridge, I suddenly realized that everyone who joined the race were all run addicts. Imagine everyone waking up early on a cool Sunday morning and expecting a heavy rain anytime of the race. While a lot of people were asleep, here we are all awake and ready to conquer a beautiful rainy morning. Then suddenly rain poured down upon us and had me figured that I can finish this race since it will be a good weather and no sun will show up before I reach the finish line. While we were all joking around during our run and was talking about a lot of stuff, I was surprised that we just completed the 10k mark. It was an easy run and I immediately psyched myself and think about the next 11k. As soon as I reached the 17th km, I immediately told Jay and Val that it was the farthest that I ran and doing the math I only have 4km remaining. But the last 4km was the most difficult part for me. I began to feel the pounding of my feet in the pavement and felt a heating sensation on my left knee.. I had to stop and stretch as I fear that I will again suffer from ITBS (I just recovered from an ITBS on my right knee). Continued running but I started to feel the numbness on my arms. My legs were tired and as I saw runners who began to walk, I was thinking of doing the same. But good thing that Jay and Val was pushing me to keep on going and advised me to just slow down if I feel tired. But there were moments that I had to walk and they will also walk. On the 18th km, Jay mentioned that we can still finish in 2:30 if we maintain the 6:30/km pace, I had a few kicks left in some point but just ended up slowing down as I really felt tired. Had it been that we planned earlier about the time we could have finished it in 2:30. We ended up finishing 2:34, not bad I guess, what was important for me was to finish a 21k run. I was happy with the result of this race obviously as I was able to complete this task and it was another milestone for me. Hope to get a repeat on the NB power race as this race means a lot to me. Congrats on your first 21K. And a nice time too. The weather really helped a lot of runners during that day. See you soon.. bike naman. congrats pards! see you at NB 21k run! just remember these two words---patience & consistency and i know you will improve in your next road races. congrats for your 1st 21K finish. not bad. you did well! @neil - thanks man, schedule natin ride next time. see you in future runs din..
@daytripper - thanks for stopping by.. hope to meet you at the NB21K, we are wearing the GONE RUNNING singlet (black).. I'll add you to my blogroll. @mr. jovie - thanks for unselfishly giving advise to new runners. It was good to finally met you personally. Hope to have more chats in the future. will keep these two words in mind.. hope you can add me to your blog list as well. Thanks! Congrats on you first 21k Mark, awesome! It was also nice to meet you and your friends :) Hope your ITBS won't flare up anymore, mine got better Thank God. Take it easy man, see you soon! Congrats on your first 21km. I too started running just this march (condura)...hope to see you soon! Hi Luis! Thanks for dropping by.. it was nice meeting you finally.. My right knee got better, taking it easy for my left knee naman.. Hope i dont get injured further.. Too frustrating when you are held to do your training.. I agree that your first 21Km is not really bad at all... my first 21k is 2:37. I have beaten the 2:30 (my imaginary cutoff) but its still a struggle for me. Still, I love joining 21K race and has become my favorite. it was a struggle.. good thing there are friends to support you all the way..
thanks for stopping by. hope to meet you also in future races.. I'll add you to my blog list. hi mark...congrats! also to Val and Jay for running with you all the way.. it was a good run for you indeed for a first "half-marathon"
the numbness in your arms is a sign of depleting electrolytes, in that scenario you should take sports drink (e.g. gatorade) instead of water, at least in the meantime, then water. water will further "wash away" your electrolytes. thanks junrox! you are right, i sometimes forget to hydrate when i ran.. yesterday at our LSD, jay keeps on telling me to hydrate as he observed that i dont drink that much. See you at NB race..
Congrats on your first 21k! Reading your post reminds me of my first 21k back in last year's edition of KOTR! I was actually training for the half-marathon when I started joining races regularly last year. I have so far been enjoying this distance very much. I hope you will, too! Too bad the NB run didn't push through but hope to see you in future races. Do you own your dream?